(photo courtesy of The Cape Gazzette). Each summer we trek to “Rehowey”(a mash-up of ‘Dewey’ and ‘Rehoboth’ for those of us that loves both equally), I find delicious tidbits to fill my artsy appetite, and this year was no different. On a particularly adventurous day, hubby and I headed OUT of the beach for a long-overdue stop in what could soon be Delaware’s next “artist colony”: historic Milford, Delaware. In a quick 22-minute jaunt north of the nation’s summer capital lies a wealth of artistic talent and experiences to which everyone should be flocking. I was so sad to learn that we were too late to bid — everything had sold — but was thrilled for Mispillion and for Julie’s legacy. (We are fortunate to own two of her pieces already, so I guess I shouldn’t be greedy.) Thanks to Mary Ann Benyo for all the love and time that she put into this retrospective. The curator there encouraged us (since we had nothing to bid on) to visit the Angelucci Studios & Gallery next door & above. We were welcomed warmly by co-owner Gail Angelucci, and made our way around the exhibit space, filled with wood-turning, metal sculpture, stained glass (Gail’s specialty), pottery, photography, watercolor and more. I especially enjoyed the solid yet delicate work by wood lathe artist, Steve Childers and the amped-up photography of Gervasio Ruiz, Jr. We climbed the stairs to the second floor where 10 artists house working studios, including “The Pearl Lady” (Joan Frense Muholland) who greeted us decked in her fine work. Back in Rehoboth, we enjoyed arts of the culinary variety, this year at Planet X Café — a funky, purple-hued Wilmington Avenue spot with large outdoor seating area of cushy pillows and breezy décor. Chef Justine is a master of eclectic fare focusing on organic, vegetarian/vegan dishes, and offering a cool list of unusual cocktails. Monday was ½ wine bottle night and we eagerly took advantage. We enjoyed the pork dumplings, but I’ll highly recommend the stacked eggplant small plate and the delicious vegan lemon poppy cake with goat cheese frosting. 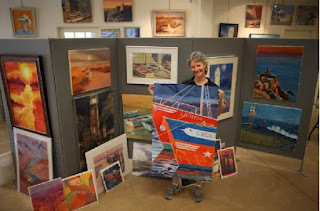 Returning to great art at the beach: Our pal Jay Pastore, owner of Rehoboth’s contemporary art house Gallery 50, is hosting his 4th Annual Fine Art Auction on Saturday, August 11, from 6:00-8:45pm at the gallery. AIDS Delaware will benefit from 100% of the sales that evening. Jay has been a great partner not only for AIDS Delaware in this respect but also for the many artists who fill his walls. His gallery is one of my favorites to discover new media, up-and-coming artists, and unique pieces. And he makes them all attainable to those of us whose budgets aren’t without limit. If you’re in Rehoboth next weekend, please stop by and check out the auction. He’s also offering a raffle for a $1,000 gift certificate to the gallery that night — and that could buy you a nice amount of ArtStuff. MKF, This thing is so cool and I went to Lewes right after reading it so I was psyched! What a great thing to recognize local artists! The Bethany Boardwalk Arts Festival on Saturday, 9/8/12 was fabulous! Rain didn't dampen the atmosphere - all thoroughly enjoyed the day --- REALLY well organized by the Bethany-Fenwick Area Chamber of Commerce!! !